Hidden divergence vs regular divergence – what’s the difference? Either type of divergence can provide a powerful edge with the right trading strategy. In this article, I’m going to show you the difference between hidden divergence and regular divergence. I’m also going to show you how these two types of divergence should be used, and I’ll give you some tips on trading hidden divergence. Keep reading to learn how to increase your odds of taking winning trend continuation trades. Hidden divergence is a sign of trend continuation, while regular divergence is a sign of trend reversal. The idea is that regular divergence shows momentum leaving the trend, which could be an early sign of a reversal. Hidden divergence shows momentum coming into the current trend, which makes a continuation more likely. The charts below show examples of both hidden divergence and regular divergence. 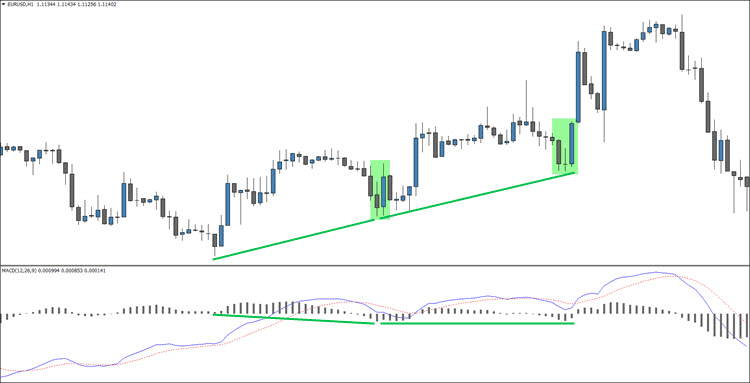 I’ve marked the bullish divergence in green and the bearish divergence in red. In the chart above, you can see some examples of regular MACD divergence. Regular divergence is measured off of the lows of price and the indicator during a downtrend, and off of the highs of price and the indicator during an uptrend. Starting from the left, price made lower lows while the MACD line made a double bottom. Next, price made a double top while the histogram made lower highs. Finally, price made three consecutive higher highs while the histogram made three consecutive lower highs. Note: You can learn more about trading MACD divergence or how to trade divergence on other indicators by clicking the links (opens in a new window). In the chart above, you can see some examples of hidden MACD divergence. Hidden divergence is measured off of the lows of price and the indicator during an uptrend, and off of the highs of price and the indicator during a downtrend (the opposite of regular divergence). Starting from the left, price made higher lows while the histogram made lower lows. Next, price made higher lows while the histogram made a double bottom. These are both examples of bullish hidden divergence. One technique that can greatly increase your success rate with divergence trading is combining your various divergence patterns with other entry triggers. For the sake of this article, we’ll be using candlestick patterns in combination with hidden divergence. In the previous chart (above), you’ll notice that I’ve highlighted two candlestick patterns. The first was a bullish engulfing candlestick pattern, and the second was a morning star candlestick pattern. Both of those signals could have helped you time your entry off of those two hidden divergence patterns. 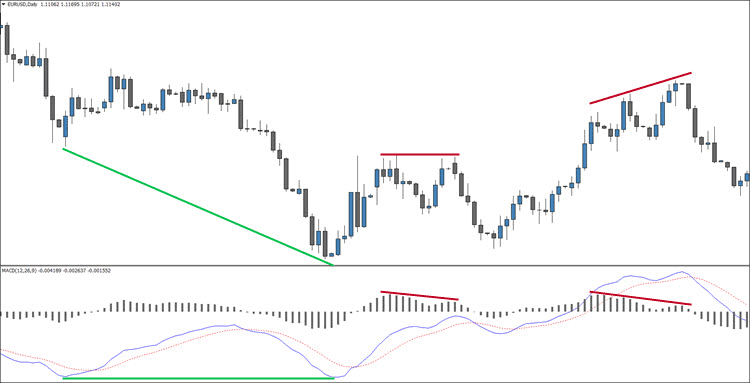 In the chart above, you can see an example of bearish hidden stochastic divergence. Price made a lower high while the stochastic oscillator made a higher high. Remember that, for hidden divergence, we measure off of the highs of price and the indicator in a downtrend. Notice: I drew the hidden divergence off of the highs in price and where those highs corresponded on the stochastic oscillator. I only considered a new high to be forming after the stochastic had crossed below the 50 line (not visible on this chart) and then crossed back above it. After this hidden divergence pattern occurred, a bearish engulfing candlestick pattern also occurred. This strong bearish signal could have helped you get the best entry with this setup. Do you see how the candlestick pattern strengthens the case for the hidden divergence pattern and vice versa? 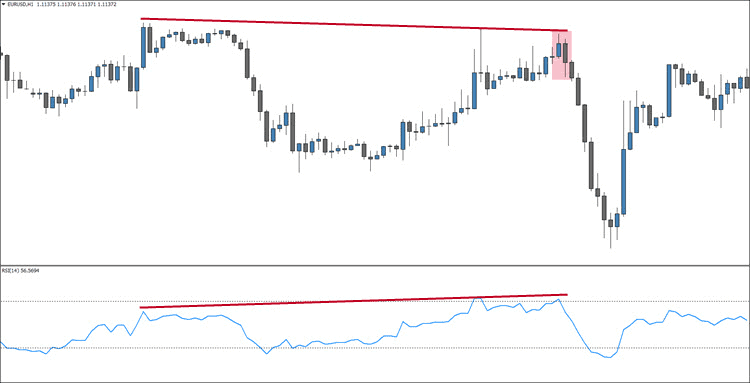 In the chart above, you can see an example of bearish hidden RSI divergence. Price made a lower high while the RSI made a higher high. A bearish engulfing pattern formed at the second high, confirming our hidden divergence pattern. Note: This was not a very good bearish engulfing pattern to take, because the engulfing candle did not close in the lower 1/3rd of its rage, which is slightly bullish. To learn more about how to trade candlestick signals, check out my free price action trading course. The candlestick signal that I highlighted above was not the first candlestick signal to occur at the lower high. However, if you had correctly placed your stop loss above the highest point in the cycle, this trade would have worked out anyway. 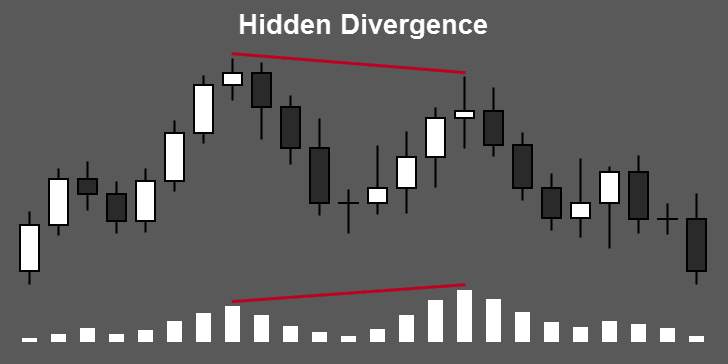 The difference between hidden divergence and regular divergence is that hidden divergence is drawn off of the highs of price and the indicator in a downtrend. Similarly, it’s drawn off of the lows of price and the indicator in an uptrend. This is the opposite of regular divergence. Hidden divergence also signals a possible trend continuation. Regular divergence signals a possible trend reversal. Both can be powerful entry signals when combined with other profitable trading strategies. Hidden divergence vs regular divergence – which do you prefer to use with your trading system? Let me know in the comments below. In my own experience, I’ve found regular divergence to be more useful, but I use both hidden and regular divergence on a regular basis. Why Develop a Trading Plan? I noticed a divergence in the weekly chart of bitcoin. But i do not understand what it means. There is a lower low in the indicator but in the chart it is a higher low. What does this mean? Which indicator? I took a quick look, and I don’t see any bullish hidden divergence on the weekly Bitcoin chart. If anything, there appears to be some bearish hidden divergence at this time. I don’t trade Bitcoin myself. Most traders that I know that do trade it are long BTC right now, so take that for what it’s worth. What time frame do you recommend trading in? Is 1 hr good? The 1H time frame is fine. I trade on anything from the 15M to the 1D. Divergence and hidden divergence work on any time frame, but candlestick patterns (which I usually combine with divergence or hidden divergence) don’t work as well on time frames lower than the 15M. what are your thoughts on trading divergencies with flat tops/bottoms on the oscillator? e.g if you spot two successive higher lows while the oscillator is showing two flat lows respectively. 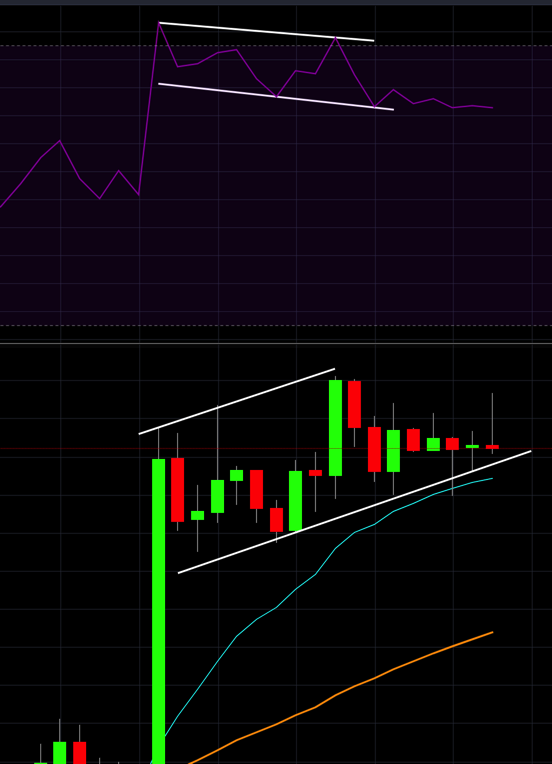 is that a good sign of hidden divergence? That would be a sign of hidden divergence. However, not all divergence is created equal. The best form of divergence is when your highs or lows in price are the opposite of your highs and lows on the oscillator (example: a higher low in price with a lower low on the MACD). The next best thing is when you have equal highs or lows in price with higher highs or lows on the oscillator (example: in an uptrend, you get an equal low in price with a lower low on the MACD). The weakest form of divergence (hidden or regular) is when you get equal highs or lows on the oscillator. This is especially true with hidden divergence in my experience. That being said, I only take the strongest form of divergence when trading hidden divergence. Hidden > regular, fails less and yields more ticks if right, because it is with trend. Regular divergences are more take profit signals for me. It depends on how you use divergence. However, I agree that hidden divergence is probably more profitable if your entry is based on divergence alone because the trade would be in the direction of the trend. There are many ways to use divergence. I’m glad you found something that works for you. Thanks for reading and good luck! Are we suppose to be connecting the peaks/troughs of MACD LINE or MACD HISTOGRAM to check the divergence/convergence? In the first example, the green line is connecting the troughs of MACD LINE, while the red lines are connecting the peaks of MACD HISTOGRAM. For both red lines, connecting the peaks of MACD LINE would give an upward trendline, as opposed to the down trendline given by the peaks of MACD HISTOGRAM shown in the example. Thanks. In both cases that you mentioned, if you weren’t trading histogram divergence, you would ignore those signals. However, if you were trading histogram divergence, you would have been provided with a couple of trading opportunities that you would have missed otherwise. There were no signals given by the MACD line during the cases that you mentioned, so there were no conflicting signals if that’s what you’re concerned about. That’s not how the MACD indicator works. If you’re referring to the small hidden divergence near the last example (red line), I didn’t mark it because I wasn’t illustrating hidden divergence yet. If you’re referring to those two signals conflicting, price did exactly what you would expect to see a majority of the time after that signal occurs. Then a separate regular divergence signal occurred (which I have marked). No conflict. Just a short-term trend continuation move, followed by a trend reversal. I hope that helps. Thanks Chris for the reply. I am new to the divergence so I am glad that I have come across this article. In those cases we discussed, whereby connecting the H/L of MACD Line gives divergence (ie. ‘signal’) while connecting the H/L of MACD Histogram gives convergence (ie. ‘no signal’), or vice versa; what are your considerations to take the given signal to be valid and make a trade entry? In the example that you mentioned, if I were trading this way, I would look for a strong candlestick pattern to occur at the point of the MACD line divergence. To me, the MACD line divergence would be the setup and the candlestick pattern would be the entry signal and overall setup confirmation. I would also, personally, only consider the trade if the regular MACD line divergence occurred after an extended trend. Sorry for the late response. I hope that helps. Hello Chris, in your personal opinion, which of the 3 indicators shown above(rsi,stoch,macd) is the best to use in a divergence strategy? So far, I’ve tried hidden divergence, but I´d like to try regular divergence aswell. I would also, to chat with you about divergence anytime soon. Thank you. I prefer to use the MACD to trade all types of divergence. I’ve had more success with the MACD than with the others (although I’ve done pretty well with stochastic “mini” divergence as taught in Top Dog Trading). As an added benefit, divergence seems to occur much more often on the MACD (especially if you are also trading divergence with the histogram). This could be useful to you if you’re combining divergence with other strategies. In order to trade regular divergence you use the macd histogram, but how do you trade hidden divergence with macd? I haven’t noticed how to do it yet. Re-read the article carefully. Keep in mind that hidden divergence doesn’t occur as often as regular divergence, regardless of which indicator you are using. Thank you for the article. I have one question that I am quite unable to find answer to. Suppose in an uptrend price makes higher lows while oscillator makes lower lows. This is a hidden divergence so the conclusion would be trend will probably continue depending on other factors of course. But if price makes higher lows and oscillator also makes higher lows than again the trend is healthy. So in both case trend seems to continue. Similarly in downtrend. So my question would be what is the difference between no divergence and hidden divergence when both suggest trend will likely continue. The idea, in the example that you mentioned, is that price is making higher lows but the oscillator is making lower lows because momentum is coming into the trend. It’s the exact opposite of what we look for in regular divergence (momentum leaving the trend). Price can definitely reverse (in the case of regular divergence) or continue (in the case of hidden divergence) without the oscillator diverging. However, when price and the oscillator diverge, we have a higher probability of guessing the direction and timing of price movements. Thank you for the reply. So you mean hidden divergence just gives higher confidence of trend continuation so that we can trade in the pullbacks whereas in no divergence we are given less proof of weather price may continue the trend from this pull back, Nevertheless trend may continue in both case ? Did I get this correctly ? I am quite new to hidden divergence. Regular divergence seem very natural hidden seem somewhat unsettling as no divergence also seem to say the same thing whereas hidden divergence also says the same thing. Yes… that’s correct. Hidden and regular divergence can be used as a trading signal or combined with other methods to make the case for a trade. They signal momentum coming into the trend or leaving the trend respectively. With respect, hidden divergence signals that there is momentum coming into the trend. Without it, it’s anybody’s guess, so hidden divergence provides a much more valuable signal than when the oscillator simply mirrors price. In fact, hidden divergence can be a particularly powerful entry signal because you are taking the trade in the direction of the trend – as opposed to trying to time the reversal of a trend. That being said, do what makes sense to you and what you feel comfortable doing. After all, it’s your money at risk. Good question, EdB, but I think you got that backward. In your image, (if anything) you have an example of regular bearish divergence followed by hidden bullish divergence. There is a lot I could say about this, but I’ll try to keep it short and simple. The example that you gave did not have enough up and down movement in price for me to ever consider that a divergence play at all. From the small snapshot you gave, it looked more like the bigging of a possible flag pattern more than any divergence setup. There will be times that you seemingly get contradicting signals, but most of these can be explained away logically by using a little common sense. Example: The whole point of regular divergence is that it often signals a change in the direction of the trend. Therefore, you should only trade regular divergence at the end of a trend. Obviously, there’s no way to determine exactly what is the end of a trend, but if you only take this setup after a few waves of a trend or more, you’re definitely not getting in at the beginning of the trend. Conversely, hidden divergence signals strength coming into the trend. Technically, you could take these signals any time during a trend. However, if you want to give yourself the highest probability setups, you would only take hidden divergence at the beginning of a trend. The earlier the better. The idea is that trends don’t last forever. They actually average 5 waves. With that in mind, your hidden divergence plays are more likely to work out if you get in early. Do you see what I mean? If you’re getting conflicting signals, ask yourself where you are in the trend. What makes sense? There’s usually an obvious answer. That brings me to my last point… only take obvious patterns. Your example was not an obvious pattern. It may have worked out, but the obvious patterns are the high probability patterns. There are many reasons for this, which I won’t get into now. They’re not all going to be textbook examples, but don’t force anything just to take a trade. Trade less. Trade smarter. I hope that helps. I just start trading divergence. I get confused when both regular and hidden divergences plays out on a chart. Is it wise to stick to just one of the divergence until one has a proper grip. Which is more profitable (Hidden or regular) and trading which do you prefer. Do you also twick the settings on your indicator or it is used as default. Yeah, Festus, you could do that. I recommend you start with regular divergence. I get a lot more trades from regular divergence. It’s easier to spot, too. If you’re trading MACD divergence on the MetaTrader 4 platform, you need to make sure you’re not using the default MACD indicator. It doesn’t use the traditional parameters. You need to use the one in this article, or one like it. I use the traditional MACD setting for divergence. In this article, I talk about how you can use candlesticks with divergence. I also go over alternate settings that I have used for divergence when using the stochastic or RSI oscillators. As far as getting confused about conflicting signals, they’re not really conflicting. There’s no guarantee as to how long price will move (if at all) after any divergence signal. If you take a bullish hidden divergence signal and immediately get a bearish regular divergence signal, get out of your play. That’s your early warning. Are your conflicting signals both obvious and strong? If so, maybe you should stay out of that pair, stock, etc. Most traders that I talk to don’t use divergence correctly anyway. They try to make every price movement into a divergence play. You should really just be going after the obvious divergence signals. Lastly, you need to keep the context of the market in mind. Hidden divergence is really only useful to you (at least as far as entry signals go) at the beginning of a trend. Similarly, regular divergence is only useful to you (no matter what you’re using it for) once a trend has become extended. The average trend lasts for 5 waves, for instance. If you’re taking divergence signals too early during a trend, the majority of them aren’t going to work out. You need to wait for the trend to become extended. I hope that makes sense. Do you have Automatic Divergencence Indicator System Albert that can be Shown directly in the dasboard MT4 complete with buy, Sell, TP and SL ? I’ve used automatic divergence indicators before. I prefer to spot divergence manually, because it’s not that hard once you’re used to doing it and it keeps the chart uncluttered. I’ve never used one with entry, exit and stop loss levels before. I wouldn’t be surprised if something like that exists, though. 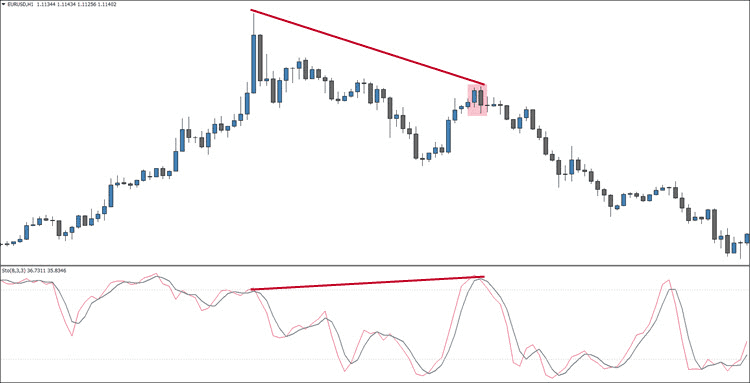 Hi, i have a question, here you have sometimes used MACD histogram and sometimes MACD lines to find divergence. I mean how we know, when to use what? You can use either. Some traders only trade the lines. I prefer to trade both, and that’s common as well.